The ultimate “ease-in” opening hole, the 1st hole is a driveable par four. Thoroughbred Golf Club at High Point, tucked away amidst the beautiful rolling hills of Jessamine County, is undergoing a renaissance, of sorts, as a the new owners from Taylor Made Farm are hoping that intelligent investment in the clubs facilities and infrastructure return the course to relevance within the Bluegrass area golfing community. 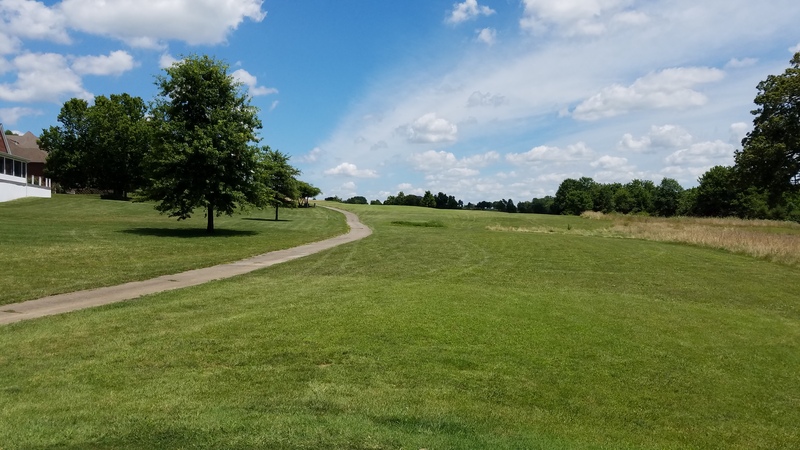 Formerly known as High Point Golf Club, Thoroughbred is being reborn as a fun, every-man course with improving conditioning under the new owners, which was a pleasant surprise. I had only played the course once in the mid-2000’s before, and was so impressed that I hadn’t been back in over a decade. 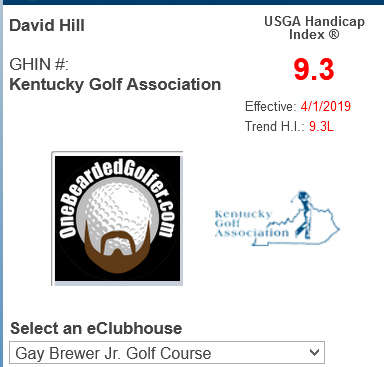 The new club’s manager, Chris Boysel, PGA, is a friendly acquaintance of mine, who really made an extra effort to make our two-some feel welcomed and make sure we enjoyed our experience. 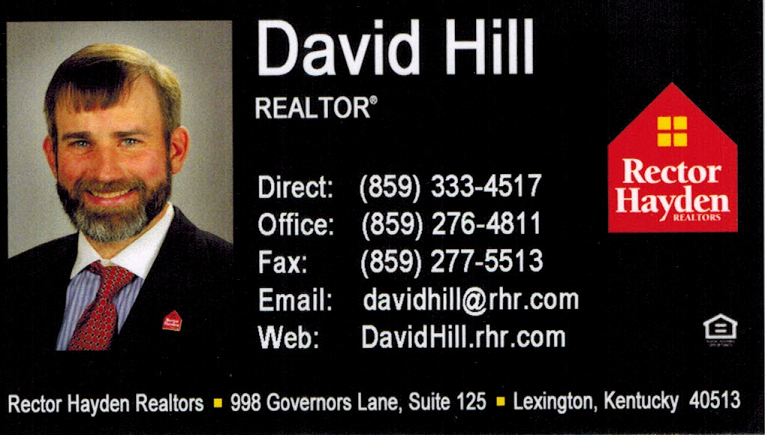 His efforts were certainly appreciated, and if he can keep his enthusiasm up, then I can’t imagine anything other than success for the new owners and their investment. When I tell you that the greens are round, I mean THEY ARE ROUND. Thoroughbred is a small, short, straight-forward residential course on which the houses merely provide scenery rather than coming into play or deterring their owners from using their back patios. 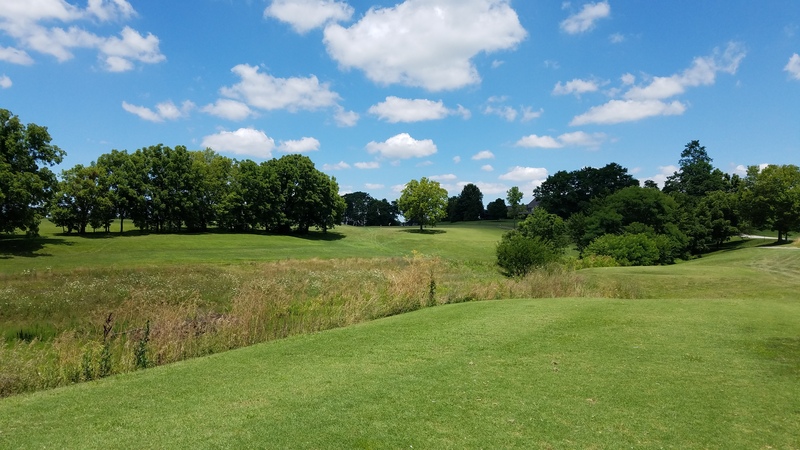 It’s an ideal layout for children transitioning from executive and par 3 courses to full-sized golf courses, and is the perfect place to just knock the ball around for beginners and novice of all ages, in my opinion. Or if you just want a change of pace that gives you an opportunity to score well, then Thoroughbred is an ideal golf course. 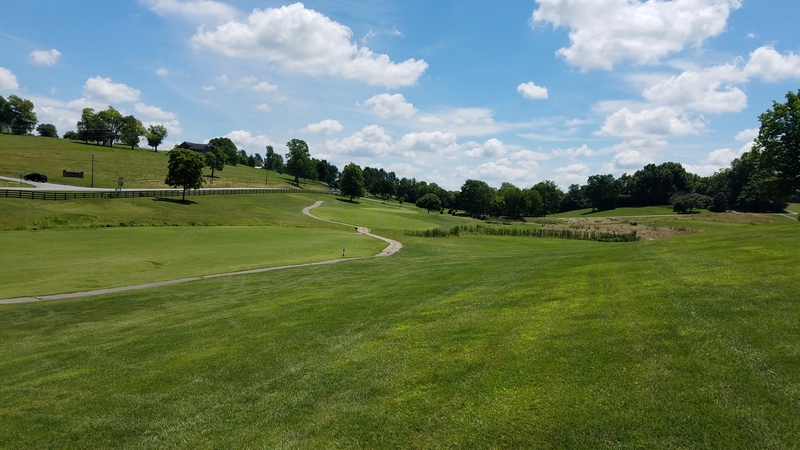 Built by Danny McQueen in 1993 as an amenity to the High Point residential development, the course sports a course rating and slope of 69.2 and 121, respectively. The front nine’s best hole, the meandering creek and cart path bring a little strategy into the round here. At a mere 6,137 yards from its longest set of tees, Thoroughbred is easily the least difficult golf course I’ve played this year. That’s not a knock on the course by any means, just my reality. What Thoroughbred lacks in strategic difficulty it makes up with the excitement of birdie opportunities and relatively easy par saves. It occurred to me that, as it turns out that shooting a relatively low score is really run regardless of how difficult or not a course may be. 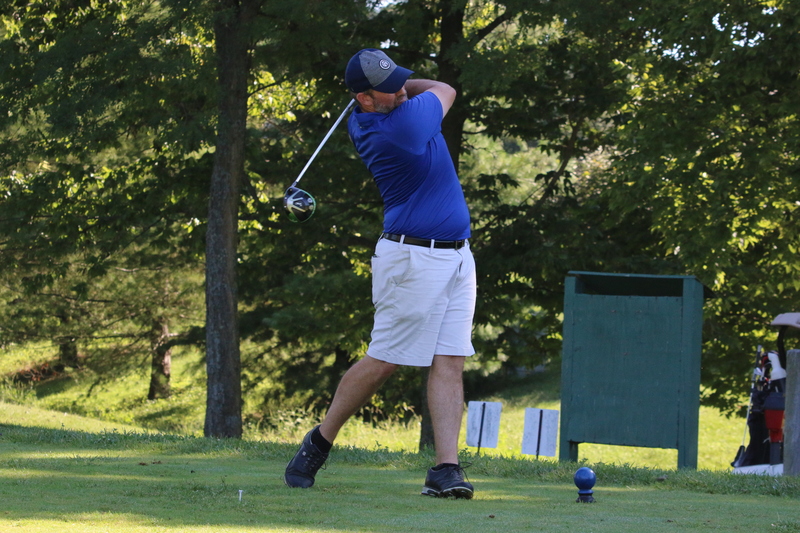 While there are several gentle doglegs and some strategy in picking the best line from the tee, there aren’t a ton of blind shots, the fairways are generally wide and gently sloping, and the greens are kept in better condition than the green fee would suggest. One of the few trees that comes into play was this big one left smack dab in the middle of the 9th fairway. 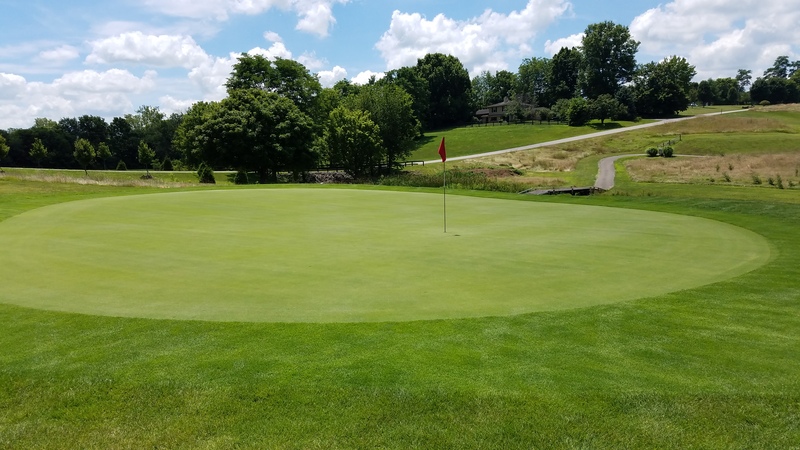 Given the harsh conditions of our sweltering Kentucky summer weather, the greens were actually in incredible condition: very green and very smooth, without the potholes and pockmarks that one finds on the busier courses. Jokingly (I think), the pro quipped it’s because most of their regulars probably don’t hit the greens with any frequency. One curious feature of Thoroughbred’s “architecture” is that most of the greens are shaped as perfect circles. Not ovals, not oblong masses, not irregular surfaces fit to the surrounding terrain, but perfect circles. I’m not sure if it is a function of keeping the maintenance costs low or the designer played a lot of Nintendo Golf in his youth, but it’s a unique feature that put a smile on my face as we traversed the course. I thought Thoroughbred was a great grip-it-and-rip-it driving course, with wide fairways and forgiving rough. Another unique feature at Thoroughbred is that the course takes the philosophy of “the 1st hole should be a warm-up hole” to the extreme, as the opening hole is a 260 yard, straight forward, driveable par 4. No matter how stiff or cold you are on the first tee, bogey is a really bad score to start. 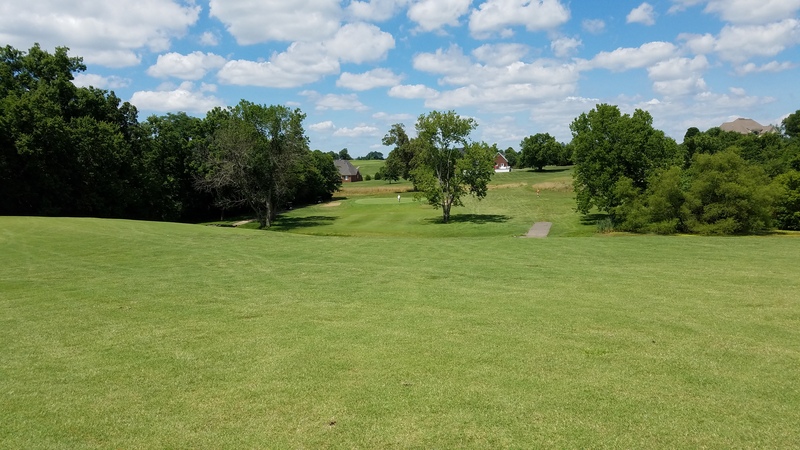 My favorite hole, and what I would argue was the best hole of the front nine, was the par 4 3rd hole, a hole in which the fairway is trisected by a meandering creek leading to a slightly elevated, gently sloping circle green. It’s one of a handful of holes at Thoroughbred that truly makes you think about playing backwards from green to tee rather than just gripping and ripping a driver. Of the two sides, I definitely like the look and challenge of the back nine. It required a bit more strategy, as the blind shots, elevation changes, attack angles, and doglegs increased in frequency, severity, and importance. The par four 12th hole was an interesting semi-blind, uphill dogleg left to an elevated and oblong green that made for one of the tougher scoring challenges. While the fairways were wide and the rough forgiving, the majority of the turf needs a season or two of proper conditioning to grade out above what you’d expect to find on any given municipal course. Thin spots and creeping native grasses could be found in most fairways, but it wasn’t anything that a competent superintendent couldn’t address with a little time and the proper resources, More importantly, the fairways were of sufficient quality so as to not really affect play. The back nine has more challenging combinations of slope and angles of the fairways in relation to the front of the greens, giving the impression that not much earth was moved to create many of the holes (revolutionary thinking in the early 1990’s). The “scenery” at the Thoroughbred G.C. includes magnificent views of this grand estate that borders the east side of the course. 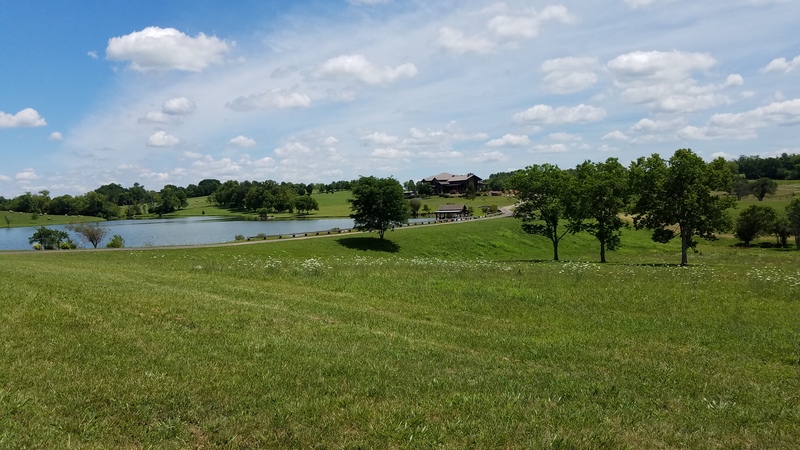 Plus, the scenery is significantly more interesting on the back nine, as the courses veers away from the housing development and opens up to the surrounding gently rolling pasture land. One principle I use to evaluate courses is that I appreciate any course that doesn’t try to be something that it isn’t. Thoroughbred Club doesn’t pretend it’s an upscale daily fee public that expects to show up on any 10 Best list. 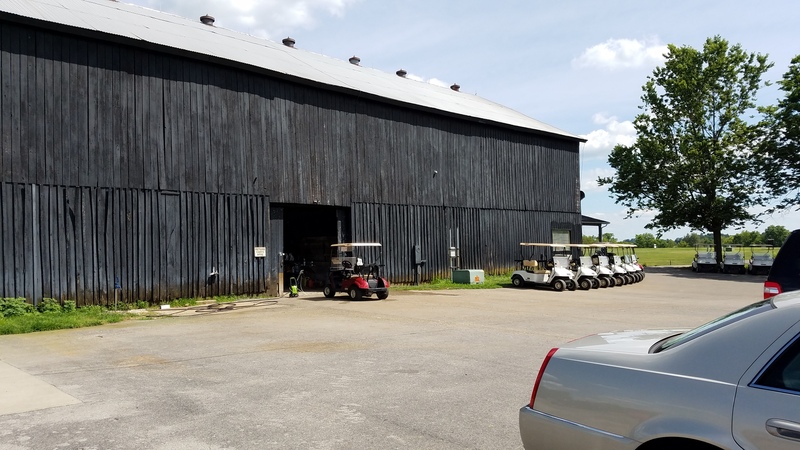 It’s a simple, fun layout with its pro shop and cart barn built into an old tobacco barn and not a whiff of pretense. It’s green fees are in line with that self-image, making Thoroughbred a good value, so long as the greens remain in good shape. Personally, I’d dock Thoroughbred a couple of style points because it’s not the most walking friendly course, with a few arduous journeys between some of the greens and the subsequent tee box. However, at the rates at which they offer carts, it’s hard to be too upset about it. The goal post trees framing the 14th green are a little gimmicky, but it’s kind of fun trying to squeeze the approach shot through the chute. 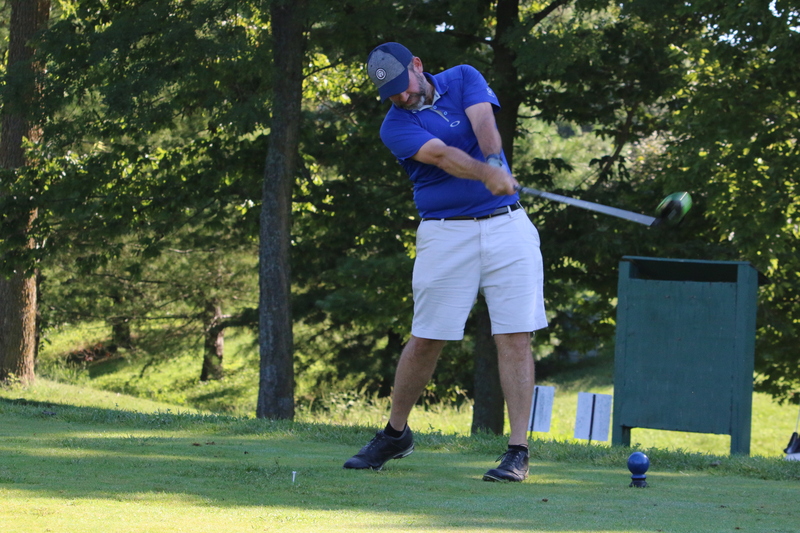 A nice bonus, for those inclined to seek a little help with their game, is that in addition to a club pro running the course, Vince Prather, PGA, is a full-time, full-service teaching pro that has set up his instruction academy at Thoroughbred. 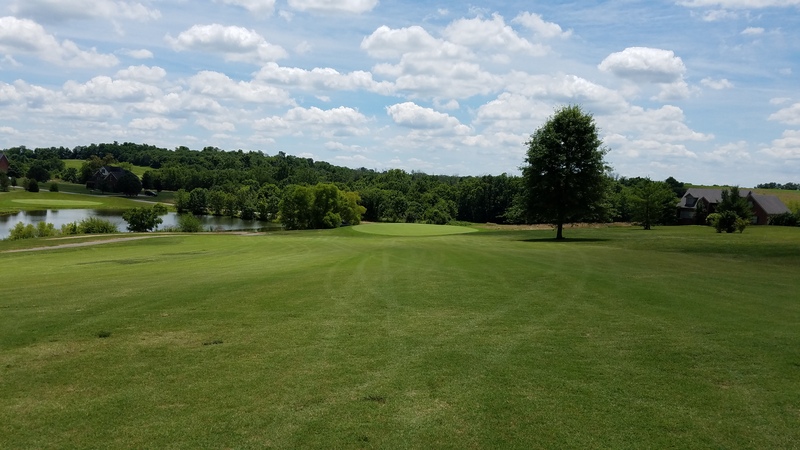 If you are looking for a place that you can get back to the basics of your game, Thoroughbred Golf Club at High Point is the perfect place to start. The club embraces its no-frills course and is priced appropriately as such, so there’s definitely value to be found there. 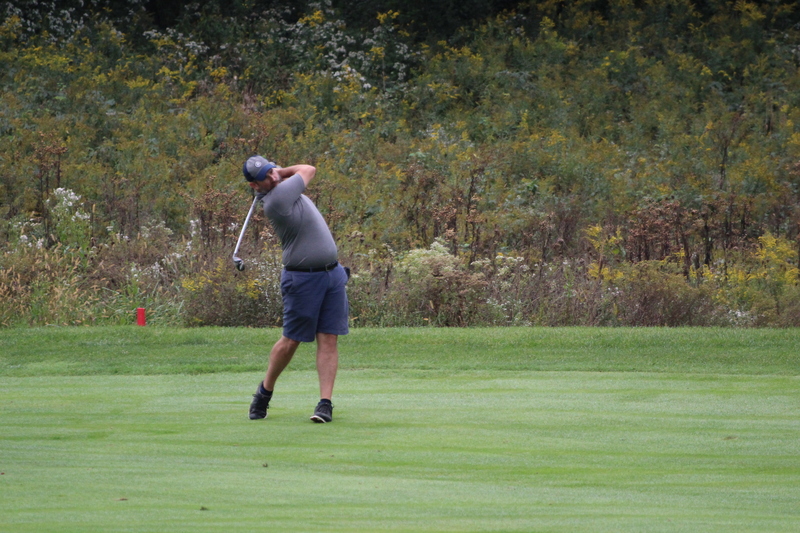 I thoroughly enjoyed myself there, and I’ll plan on returning at least once or twice a season to see what kind of progress the course is making. With properly calibrated expectations, I can recommend that you do the same. Thoroughbred GC just oozes levity and relaxation; seriously, this is the Pro Shop and the Cart Barn. As mentioned above, there is something exhilarating about writing down a whole lot more 3’s and 4’s on your scorecard than you’re used to seeing. 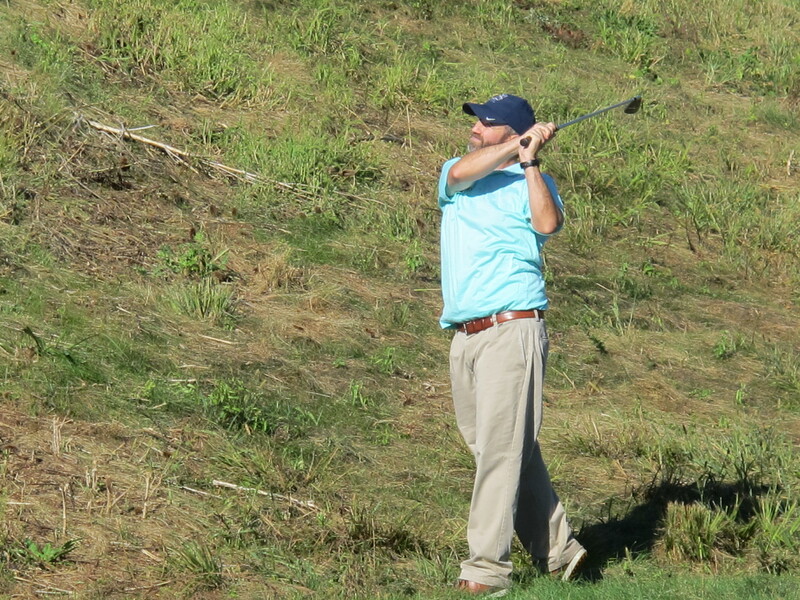 Golf is supposed to be fun, and that is never more true than it is down on High Point. Golf is suppose to be fun. Sometimes, I think we forget that on our quest to be better golfers. Thanks for the reminder! Dave, what have they done with their fairways? 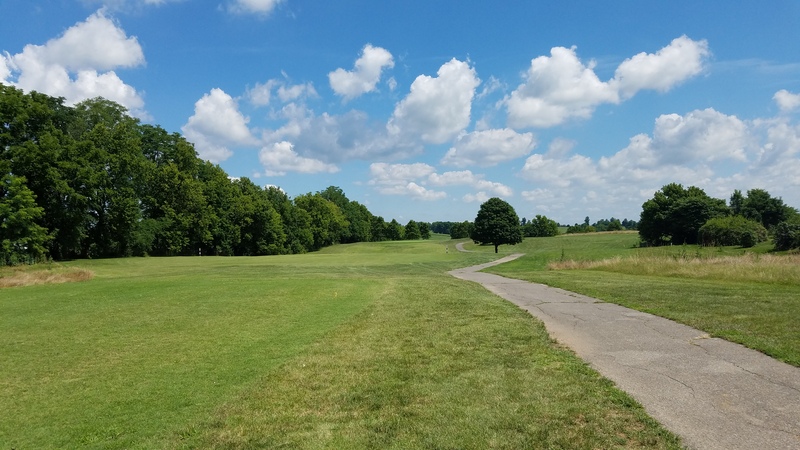 Last time I was there (can’t remember if it was summer of 2015 or 14…2015 I think) the fairways were like someone’s really really bad lawn…mostly crab grass, dandelions and other undesirable gasses/weeds. Have they corrected that with some sort of new turf? I think they’re slowly bringing them to health, but no idea on the specifics. I do know that there was only really one fairway in which thin grass was an issue.